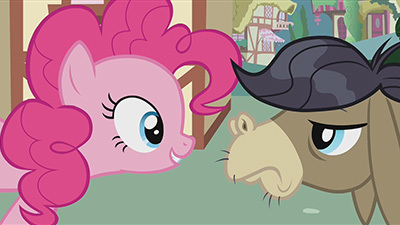 In which Pinkie Pie meets someone that she can’t convince to smile, so embarks on an epic quest to make him smile. I’m having a lot of trouble with this one. It’s obviously a Pinkie Pie showcase, with her cheering up literally every single pony (and Zebra, and Cow) in Ponyville. That is literally her thing. Twilight Sparkle studies, Applejack works the farm, and Pinkie Pie makes people laugh. So what happens when the Irresistible Laugh meets the Immovable Grump? Cranky Doodle Donkey is… oh, goodness. I’m glad that Pinkie Pie went straight to singing Yankee Doodle Dandy, because that name is definitely derived from the song. And the song is worked into the entire episode, even replacing the closing tune. It’s not the only song in the episode, either, with Pinkie Pie’s three minute “Smile Song” setting the stage that Cranky walks in on. I’ve got a lot of sympathy for Cranky. He fills the grumpy, introverted part of my heart with… well, whatever the grumpy equivalent of joy is. Schadenfreude, maybe? Here is someone who has spent most of his life on a failed quest; traveled from one end of Equestria to the other, visited every town and city and hamlet looking for someone, made friends the world over, and ultimately given up and retired. He is out of juice, he is worn down to nothing, he is just plain tired. 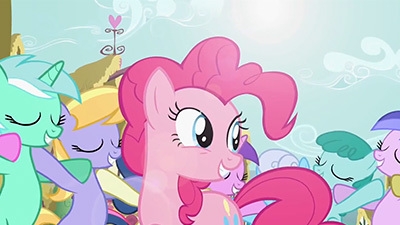 And then here comes Pinkie Pie, singing songs literally out of nowhere, making it her personal mission to see him smile. Cranky is appreciative of the effort. The full makeover, the new toupee, he thanks Pinkie Pie for them both. But he really just wants to be left alone. And that’s where the episode loses me. 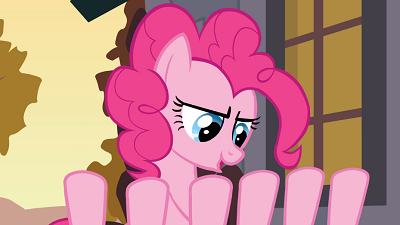 I cannot count the number of times that Cranky tells Pinkie “no” or “leave me alone” or “go away”. Twilight Sparkle even counsels that Pinkie Pie give up and leave Cranky alone, and she eventually does so… or will, right after he accepts her apology. Speaking as an introvert? That level of unrelenting persistent pursuit is deeply unsettling. It’s similar to Rainbow Dash’s escape from the hospital two episodes ago in that the pursuer just keeps coming. Cranky just can’t get away, despite all his efforts, and he just wants to be left alone. Ultimately, he barricades himself in his home, Pinkie-proofing it to the point that she actually goes away. Briefly. I put two and two and two together, and it added up to Matilda! Pinkie Pie has figured out that the person Cranky has been searching for all these decades is Matilda, a Donkey who’s been living in Ponyville the entire time. Since Pinkie’s friends with everyone, she has an incredible amount of information to deduce from, and she’s sharp enough to do it quickly. She reunites the two, gets the smile from Cranky, and succeeds in bringing joy to someone despite their best efforts to evade her. Something about that still rubs me the wrong way. I mean, I’m glad that Cranky and Matilda got their happy ending, and I’m happy that Pinkie Pie succeeded in facilitating it, and I’m even happy that Pinkie Pie’s letter to Celestia specifically mentions that wanting to be left alone is fine. But the way she got to that end bothers me. I think it’s that the lesson was learned but not applied. Sort of like, “it’s okay to be alone right after I completely get up in your face and make you smile”. I do love that Rainbow Dash is reading another Daring Do book in Twilight Sparkle’s library. Continuity, especially related to character growth, is one of my favorite things. I also love how Pinkie Pie’s internal thought processes are made out of felt. It’s such a break from the normal animation style that it feels perfectly natural for her. It’s something of an odd coincidence that this episode came up for us when it did, considering what just aired recently with where the show is currently (well, okay, a week ago, but still). Suffice to say for those not up to date with the series that yes, Cranky will be back at some point. I think this episode is probably far more remembered for the song than it is the actual episode that comes with it. The Smile song was a huge, huge hit with the fandom, to the point that it managed to finally unseat the behemoth that was Winter Wrap Up as the go-to sing-a-long song of choice whenever a grouping of fans decided to break into song at any given point (like prior to a screening of one of the movies, or in lines at conventions, or just for the heck of it at any given meetup). I absolutely adore the song. It’s the closest thing to an image song for any of the characters within the main series (the only other real examples being the bonus song shorts attached to Rainbow Rocks), with the lyrics perfectly describing Pinkie’s personality and main drive in life. It’s easily the best part of the episode. This is also an episode where both Shannon Chan-Kent and Andrea Libman do Pinkie’s singing voice in the same episode (the former singing the Smile Song and the latter singing the Cranky Doodle Donkey and the Welcome Wagon songs). As for the episode itself… I actually really like it. I do understand the potential complaints, as Pinkie doesn’t really suffer any kind of consequence for the hell she puts Cranky through aside from feeling sad for a few minutes, and the way she goes about everything sort of calls into question whether or not she really learned anything. Arguably the lesson might have been a bit better applied without Pinkie rather blatantly disregarding Twilight’s advice, and having that be the turning point in the change to her approach, as that’s probably the “going a bit too far” moment. In addition to that, Pinkie tends to be written in a few modes, and the “hyperactive annoyance” one that she has in this one does have a tendency to be done a little sloppily. By and large I love watching her even from this angle, but she’s just a touch too socially oblivious in this one, to the point of coming off as either uncaring and cruel or completely clueless, which doesn’t really mesh with what we’ve seen from her before. But aside from that, I still find this episode really fun. I love the callback to the “you can’t run from Pinkie Pie” gag, love the welcome wagon complete with confetti cannon and cake oven that of course get mixed up, love Pinkie’s slapstick antics (she’s straight up channeling Dee Dee with a nearly direct line lifted from her at one point), love that Rainbow Dash is reading more Daring Do, I love that Muffins wound up in the snowglobe somehow… I can’t come up with too much to actually say about any of this, other than that I find it all fun. Man, this episode’s song (the “big one”, that is) absolutely obliterated everything else in my memory about this episode, so much so that I had completely forgotten that it opened with the Cake babies. That along with Dashie reading with Twilight (eggheadification complete!) shows how MLP:FiM does try to incorporate some continuity in the series, something that is occasionally overlooked in other such heavily episodic series. In fact, that we do get this continuity in this series is one of the (many) reasons I love it so much. But as fun as occasional continuity is to talk about, there’s something much more important here: THE SONG. When I first watched this episode so many years ago and heard the song for the first time, I actually found myself cringing a bit at its sugariness. Okay, a lot. Maybe I was feeling grumpy that day or something, but I was very much in the “iffy” category with it then (thereby making it, at best, a #2 song on my rating scale). 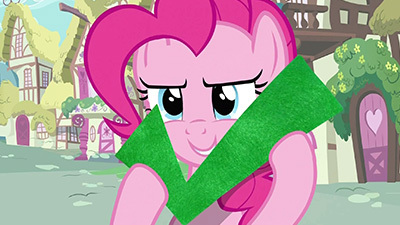 It wasn’t until a while later in a vivid bout of fridge logic did the song trigger an abrupt and profound revelation in my mind: after a season and a half of putting up with this annoying pink pony named Pinkie Pie, I finally “got” her. I finally understood what makes her tick, what makes her get up and embrace each day, what makes her who she is: “There’s one thing that makes me happy and makes my whole life worthwhile, and that’s when I talk to my friends and get them to smile.” She absolutely breathes that energy like air, and she inhales quite deeply. Why it took me so long to finally come to that understanding eludes me; I suspect it has something to do with extraversion being a difficult concept for me to wrap my head around (much as Rarity’s fashion obsession is so foreign to me), but the important thing is it happened and she finally “clicked” for me. She went from being a pest to a wonderful character, one I had been misinterpreting and under-appreciating for so long but could now finally enjoy. And all because of that song… that wonderful, wonderful song. My favorite of the season, and (in terms of songs we’ve gotten thus far) topped only by Winter Wrap Up and Art of the Dress. I share Tessa’s adoration of the Smile Song as a great anthem for the brony community. Now, I know singing the Smile Song in public these days is seen as a bit passé, sort of like reciting All Your Base (oh come on, it’s such a great piece of nerd culture, don’t give me that look), but once upon a time it was the ultimate sign of friendship and camaraderie that rang from all corners of the brony community. Going to a brony meetup or a convention, making a bunch of new friends, and ending the night or event with everyone standing in a big circle with locked arms singing about filling our hearts up sunshine sunshine… yes, it’s absolutely silly, and yes, you look and sound like a dork doing it. But in the famous words of physicist Richard Feynmann’s wife, “What do you care what other people think?” The Smile Song shows the kind of friendship everyone needs a little more of, and it’s a wonderful feeling when you find yourself in a community of folks who share that same ideal. The singing circle of friends thing may not happen much anymore, but the spirit the song engenders lives on nonetheless. And that’s the story of how a song that once made me cringe now makes me tear up with pride and happiness. Now, back to your regularly scheduled deconstruction about a donkey that absolutely refuses to smile. Er, well, actually, Weston pretty much nailed the episode part, so I’m not sure there’s a whole lot I can add… in large part because the only reason this episode even registers on my radar at all is because of the song. Pinkie Pie is right on par with Twilight in Lesson Zero as far as “trying way too hard and at the expense of everypony else to do what I think is what needs to be done” and it’s a bit very much on the irritating side. Even though I “get” Pinkie now, her antics of going way over the line when it comes to getting her way still frustrate me. The way she treats Cranky is absolutely horrendous, and I don’t blame the poor guy for taking it so badly. As Tessa described, it’s not clear whether Pinkie actually understood why Cranky was being so (ahem) cranky or truly learned her lesson. Sure, by the end of the episode she does help Cranky realize his lifelong goal up to that point, but in the process she pretty much makes his life miserable. It’s an odd case of whether the means justify the end: were Pinkie to annihilate the fabric of reality but ultimately bring Cranky and Matilda together, would that be okay? Granted, an episode about cost-benefit analysis would probably be far too drab for a show like this, but I have faith that the writers and animators could have pulled it off. I mean, what better way to liven up a dull topic than with bright pastel ponies? 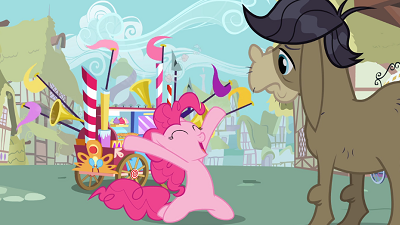 At the end of the day, there are only two things about this episode that ever really stuck with me: the song, and that this is when I finally got Pinkie Pie. With regard to that second aspect, I’ll leave you with Heavy Laughter by 4EverfreeBrony, an excellent and lively song that celebrates the perpetually unknowable but undeniably lovable Pinkie. I love so much of this episode. The songs, the gags, Cranky, the felt fantasy, the bouncing figures scrambling on the map. There’s a lot to like. I also enjoy that we get a prolonged look at donkeys in this world. While visibly a minority, at least in this part of the world, they do seem pretty well accepted, with invites to the Gala and several retiring in Ponyville. They don’t have marks, so I guess they don’t share that societal tie that Zebras do, but seem to do well enough to get along and still scrape out a comfortable living. We also get a brief look at a cow in town, but it isn’t explored much. 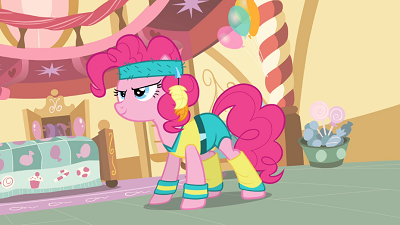 I do agree though that there’s a lot of wrong to how Pinkie goes about things. Swap the genders and she’s the dude who refuses to go away unless you smile, and the big payoff at the end is that, yep, she only leaves him alone after he smiles. This is completely lacking in a lesson on her part, and randomly digging up Mathilda from nowhere completely robs Pinkie of having to a) face her own behavior, and b) facing the extent of harm she caused by burning a book with such a deep sentimental value. And what of that red jewel she accidentally flung which started the fire? Didn’t he say that was important, too? Where did it go? That’s an odd oversight. This is very typical AKR to me. Very sharp and entertaining, but seems completely unaware of when it goes down the wrong track, and thus never really deals with problems it’s setting up. They had a great opportunity. When Pinkie is first rejected, there’s this wonderful moment where she hides and huddles up and seems on the verge of another insecure break at her failure to make a friend. It’s a tiny flicker, but poignant given her backstory and having seen the last time she broke down. But she shakes it off and powers on. That’s comforting, but why not just have the rest of the story be fueled by that insecurity, give a motivation behind her desperation which she ultimately has to face in order to get past. This could have been a really touching story, exploring both sides of Pinkie following that amazing musical number. Alas, it just kinda ended.